Erin Coates, ‘The Pact’, 2017. 2K video, with sound, 7min 20sec, sound composition: Cat Hope & Decibel. Courtesy: the artist and MARS Gallery, Melbourne. 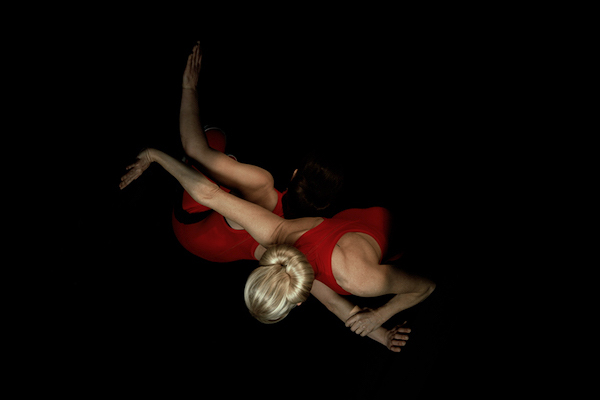 The Pact explores elements of physical endurance and the body in space. The video operates as a double-portrait of two women – the artist and her real-life climbing partner. Set inside a dark void of indeterminable dimensions, the scale and shape of the space are defined by the movements of the women’s bodies. The figures perform a tessellation of gestures as they weave in and around the dark space, forming symmetrical patterns with their movement.